Which one looks to be the best? Last edited by GicaEric on Mon Feb 04, 2013 9:06 pm, edited 2 times in total. I would say the McLaren looks pretty good at the minute! But the Sauber is a big step up from last year.. The VJM06 and STR8 didn't get me excited, and I think the only reason the RB9 did was due to the Purple! Every car is very basic at the moment with many parts missing before the first test, so too early to say really. You can only really judge features built into the chassis like sidepod shape and undercut, and on that aspect the Sauber has definitely been the most interesting/impressive. McLaren look to have improved a lot of the features on their car, Ferrari and Lotus look solid, something funny is going on with the rear of the Mercedes, and Red Bull haven't given anyone a chance to have a good look at the important bits yet! Are we talking about competitiveness here? Because there is absolutely no way of telling at this stage. Pre-season testing will provide a few clues we won't really know until Australia. If we're talking aesthetics, then the Ferrari is my favourite so far, probably because it's such a massive improvement on last year's monstrosity. I like the Red Bull in purple too. Yesterday i might have said Sauber, but the Lotus has grown on me, especially if they keep the names on the engine cover. Last edited by Deep_blue on Mon Feb 04, 2013 6:15 pm, edited 1 time in total. The Merc looks fantastic in my eyes. I've not really found myself drawn to one as of yet. Last year it was McLaren, for the obvious reason, although in terms of livery I definitely preferred the Lotus. This year, just in terms of the livery, nothing seems head and shoulders above the rest (in my eyes, anyway). Would've said Lotus again, but I find the red a little off-putting. Maybe Ferrari, actually. Looks better from the front, though. The Sauber livery is probably my least favourite, and reminds me way too much of the 2010 Hispania. The 2013 Ferrari looks sleeker than its recent predecessors and could be quick. It is also the best looking car, edging out the McLaren. Somehow, I was not that much taken with the new Sauber, mainly because of the dull livery. The most horrendously ugly car is undoubtedly the RB9, with its lack of a modesty panel and that purple haze. But then, F1 isn't a beauty competition. 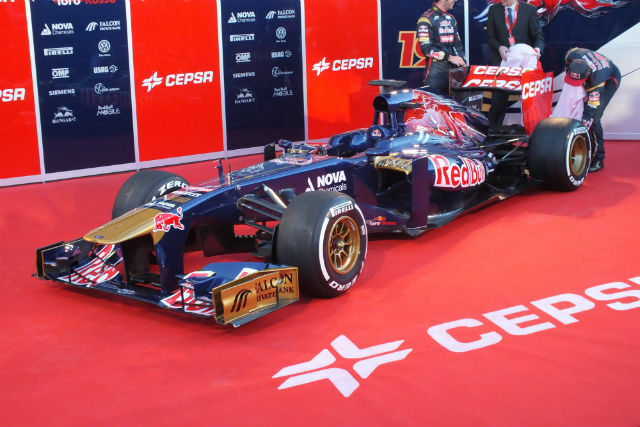 Isn't the pictured Torro Rosso last year's car? Last edited by the incubus on Mon Feb 04, 2013 7:43 pm, edited 2 times in total. The Sauber edges the Lotus for me - Lotus looks great until you get to the nose, then it all goes out the window. the best in terms of what? I don't think any really grab the imagination. Lotus, the Red and black don't go IMO. The reds to bright or something and it's sore on the eyeballs. Macca. More of the same. It's starting to look dated. Ferrari again more of the same. I wish they would go back to the early'90s Red with the black wings. Force India more of the same AGAIN. No good for a drive up the Shankill. Sauber probably the best but a bit '10 HRT. Red Bull. The flip paint just makes me think of all the chavvy sprayers at a training school near my old work. They used to all spray their Novas in the clown paint because it was cheap for them and supposedly the in thing for pretending they were Vin Diesel and Paul walker. Merc, never liked the colour scheme it's just a dull grey and a really ugly green and that nose looks iffy. Torro Rosso again more of the same. I don't think so. I pulled out from Google Images, yet I might be wrong. Anyhow, didn't seem much different from STR 7, same livery, although the rear portion of the car seems very unusual, they might be better this year. Please change the image for the Toro Rosso to the current car! McLaren and Sauber for me. Sabuer! Easily the best looking car. STR is the best looking by a mile. I've already said it and seems I have no choice but to say it again: Plotus, precisely because of the platypus. Although, I agree with Johnston about the red colored parts, they don't look good. Last years color scheme was better. But the car is the best looking of all so far. It's not really fair if you're going on solely on the picture in the thread as some of the cars really don't look their best side on, and for some that is probably their best angle. However, I'd probably go for the Sauber or Lotus. They all look pretty decent to me, except for the Red Bull and Force India, which look absolutely awful. The STR and Sauber look particularly decent this year. When compared to last year, its got to be the Sauber. The Red Bull just looks fairy cakes. Really, really fairy cakes. The Ferrari has a nice subtle change with the black but I'd still like to see more going on than just red slapped on the car with a Ferrari badge. I would like to add Lotus to the list, but they haven't made a good enough attempt at hiding that god awful nose for my liking. The Ferrari looks like a shark. RB and STR ugly livery but RB looks nicer now than previous years, nice they added the purple. FI, is just meh. Don't think it looks good, don't think it looks ugly. Sauber for me, mainly due to that livery, so nice. Also F138 looks cool. Other cars (except for Lotus, but not in good way...) looks pretty much the same as last year (liveries I mean). In example, McLaren can be nice looking car overall but that livery is just so "old" that I got bored by it . But that is just my opinion. Marussia for me even though nothing really stands out for me. Looking at these I realize how much I miss the late eighties and early nineties liveries. Sauber looks the best I think, simple, but striking and purposeful. I like the new Ferrari except for the nose, it looks stubby. However, it is of course infinitely better than last years hideous step. McLaren always looks nice but the livery is getting tiresome, hopefully they will give it a change up next year. The Lotus is growing on me, but I am just unsure about the red, I think I would prefer it if the sidepods were just plain black. Force India and STR pretty boring. Mercedes, boring as always, even though their car is an interesting shape. The Red Bull looks straight up rancid. The Marussia is very nice, but it reeks of "GP2 Team" to me, not sure why. The Merc pic seems distorted and does not do justice to the car methinks. Always loved Merc's livery, especially in 2011. I think the downfall these days is that teams try to incorporate so many different sponsors' colours...to the extent that i don't even notice who the sponsor is anymore because I just think "pile of puke". I'd hardly call the Caterham british racing green anymore, going on the pictures...and where are the bright yellow, green and orange liveries of yesteryear...it's all very conservative, and when it's not it's covered in big letters which are really ugly.